This track is an example of simulated data modelled for the ATLAS detector on the Large Hadron Collider (LHC) at CERN. The Higgs boson is produced in the collision of two protons and quickly decays into four muons, a type of heavy electron that is not absorbed by the detector. The tracks of the muons are shown in yellow. 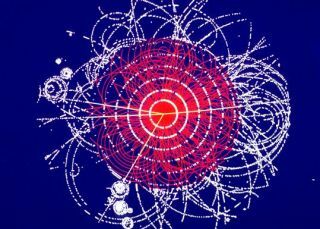 The discovery of a new subatomic particle that is likely the elusive Higgs boson — a particle thought to give all other matter its mass — could be an important step toward uncovering the invisible stuff that makes up the majority of the universe, physicists say. In a much-hyped announcement yesterday (July 4) from the world's largest atom smasher, the Large Hadron Collider in Switzerland, scientists reported evidence of a new "Higgs-like" particle with roughly 125 times the mass of the proton. The researchers claimed a high level of certainty that the new particle is the long-sought Higgs boson, which is thought to answer how all other matter has mass. The long-sought-after Higgs is the missing link in the reigning theory of particle physics, known as the Standard Model, but finding the Higgs has even wider implications: It opens the door beyond the Standard Model for explaining the existence of dark matter, the mysterious substance widely thought to make up 83 percent of all matter in the universe. Dark matter has yet to be directly detected; its presence is inferred based on its gravitational pull. Confirming the characteristics of the newly found Higgs-like particle could account for dark matter. "We can't really deny the existence of dark matter," Newman told SPACE.com from the European Organization for Nuclear Research, or CERN, in Geneva. "The Higgs particle that we found doesn't prevent us at all for searching for particles that lie beyond the Standard Model. We still need a candidate for dark matter." If the newfound particle is consistent with the Standard Model, physicists may be able to use these results to craft a more encompassing picture of the universe. "You can think of what we found as the key part of the genetic blueprint of the universe," said Maria Spiropulu, another Caltech physics professor of physics, who was in the audience at the July 4 announcement in Switzerland. "You can think of what we found as the key part of the genetic blueprint of the universe," Spiropulu told SPACE.com in an email. "You remember in 2000 what we all exclaimed and learned about how the genome will lead us to new places. This is a good analogy on the road we are down on, in terms of changing things in our understanding." Further experiments could indicate that the composition of dark matter requires a more fundamental explanation than the Standard Model, Newman said. "Even if we find out that this is indeed, to the best of our ability to measure, the Standard Model Higgs boson, there are all these other questions that are unanswered. One of the first questions is: What composes the dark matter in the universe? There's no room in the Standard Model of the universe to make up the dark matter, so we have to look at other candidate alternatives." One such alternative is known as "supersymmetry" or SUSY, which is an extension of the Standard Model. Supersymmetry suggests that every known elemental particle has a partner that is identical except for its spin. For instance, photons would have partner "photinos," and electroweak bosons would have duplicate "electroweak-inos." "Now a Higgs-like sector in SUSY becomes very rich," Spiropulu said. "You have a set of "higgs-inos" as partners. How the dark matter candidate behaves has to do with how it shakes hands with the electroweak-inos and the higgs-inos. So the (very, very) weakly interacting massive particle of SUSY that fits the bill for the dark matter composition of the universe is coupled to the existence of some Higgs and its supersymmetric extension." The confirmation process for the new particle will take time, as physicists run more experiments and analyze wider sets of data to be sure they are not witnessing anomalous events. Still, it is an exciting time for science. "Whatever happens, Standard Model or no, we are at the edge of a tremendous generation of exploration," Newman said, "either to find out what's wrong with the Standard Model, or to go back to looking for what are the more fundamental things that are outside the model, and how we explain those."